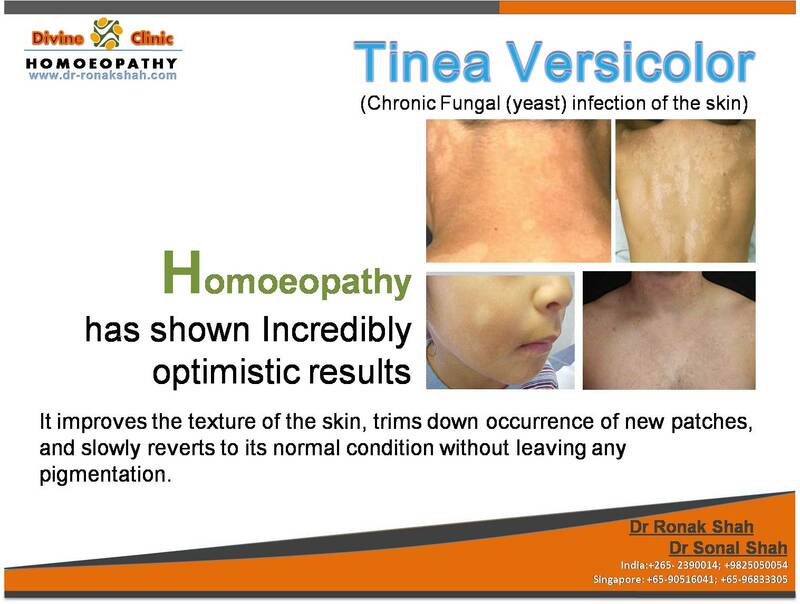 Homoeopathy has shown incredibly optimistic results in cases of Tinea Versicolor. Homeopathy considers Tinea Versicolor or any skin disorders as a local expression of a system disturbance, a manifestation of an internal imbalance that needs to be treated from within. Homeopathic remedies treat the fungal infection and turn on the melanin producing cells in the skin. This further improves the texture of the skin, trims down occurrence of new patches, and slowly reverts to its normal condition without leaving any pigmentation. Tinea (pityriasis) versicolor is a chronic fungal (yeast) infection of the skin mainly which is observed in children as well as in adults. This condition is commonly observed in people especially in tropical and subtropical countries such as India. It has a tendency to stay on for many months or even years, as fungus tends to be resistant to many treatments. · Sometimes severe “pin-prick” itching in the affected areas; usually when the person’s body temp is elevated due to exercise or a hot/warm environment, but the person hasn’t started sweating yet. Once sweating begins the “pin-prick” itching stops. These spots commonly affect the back, underarm, upper arm, chest, lower legs, and neck. Occasionally it can also be present on the face. The yeasts can often be seen under the microscope within the lesions and typically have a so called “spaghetti and meat ball appearance” as the round yeasts produce filaments. In people with dark skin tones, pigmentary changes such as hypopigmentation (loss of color) are common, while in those with lighter skin color, hyperpigmentation (increase in skin color) are more common. These discolorations have led to the term “sun fungus”. · Selsun shampoo containing more than 1% selenium sulfide. It is normally applied to the skin and washed off after 10 minutes. Homeopathy works extremely well in the cases of Tinea Versicolor. One may expect complete recovery. Some the commonly indicated medicines include Tellurium, Bacillinum, Sulphur, Psorinum, Natrum muriaticum. The right medicine is selected on the basis of patien's individual symprtoms.